PanARMENIAN.Net - Armenia is the first out of 42 participating countries to announce their Eurovision 2019 participant. 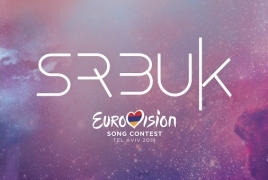 Tonight, during a late-night talk show on Public TV, Srbuk was announced as the country's hopeful for next year's competition in Tel Aviv, Israel. “I am starting a new journey now, which, I am sure, will be full of new and pleasant emotions, challenges and amazing experiences! I am grateful to all of my friends and fans, who are always with me and have always wanted to see me on the Eurovision stage," the singer said. A decision on Srbuk's participating song has not been made yet. The Armenian broadcaster has announced an open call for song submissions.